Book Challenge Day 3- A Book That Makes You Laugh Out Loud | What are we...the Whos? This was definitely a hard one for me. Kinda makes me wonder if I laugh out loud too often and should be embarrassed for getting so into books. But, I decided to go with my gut instinct on this one. As soon as I read the challenge, About A Boy popped into my head. I read this book last summer while on vacation with my family and got sucked in immediately. Will, the main character, is a sarcastic, spoiled, useless human being and I love him. Nick Hornby does a phenomenal job with Will’s thoughts. They’re so real and horrible in a hysterical way. I knew I was enjoying every page I read, what I didn’t realize was that everyone around me knew that I was enjoying every page I read. About halfway through the book, my mom sat up and goes “Okay, what are you reading? I’ve never heard you laugh like this with a book.” So there you have it. A funny read of a serious story. Highly recommend. Get ready for “A book that makes you cry” tomorrow. 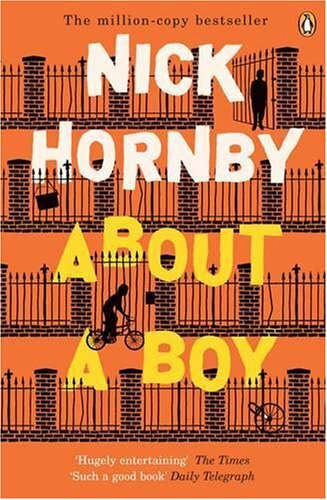 Posted in Authors, books, Reading, Writing and tagged 30-Day Book Challenge, About a Boy, Nick Hornby. Bookmark the permalink. Is this the book the movie’s based on? It is! And the movie is a pretty good representation of the book- though not quite as good. I love the movie & would now love to read the book! And an author who makes me laugh out loud: John Green. Can’t take his books in public! I’ve never read any of his stuff, I’ll have to check him out! Pingback: Book Challenge Day 23- Favorite Male Character « What are we…the Whos?